MKQ - Men’s Monochromatic Black Gold Black Diamond Ring A dark and mysterious addition to your jewelry collection, this Men’s Monochromatic Black Gold Black Diamond Ring works elegantly alongside professional daywear and modern evening attire. Crafted from ceramic ring, tungsten ring, or cobalt ring, it features a black gold insert studded with black diamonds at the quantity of your choice. This engrave-able ring is available in various widths and diamond quantities to suit every taste. A dark and mysterious addition to your jewelry collection, this Men’s Monochromatic Black Gold Black Diamond Ring works elegantly alongside professional daywear and modern evening attire. 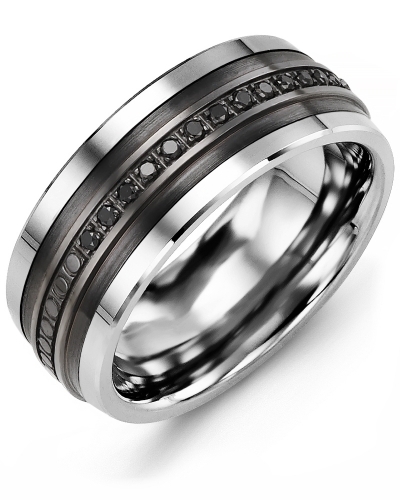 Crafted from ceramic ring, tungsten ring, or cobalt ring, it features a black gold insert studded with black diamonds at the quantity of your choice. This engrave-able ring is available in various widths and diamond quantities to suit every taste. Really satisfied, we had some custom problems when we had to send it for resize as I ordered the wrong size that were immediately resolved by Madani. Gorgeous Ring and very satisfied. Quick response time and communication. When I ordered the ring I couldn't believe how quickly the ring came and the packaging to protect it was excellent. Here we provide lifestyle shots of our products in action. This helps to give you an idea of what the ring looks like when it is in the "real world". Submit your own lifestyle shots via any social media platform and/or our contact page.